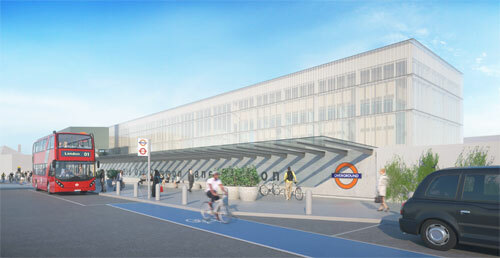 The first new Overground station would be on the line south from Willesden Junction towards Richmond, about half a mile from the former, alongside Old Oak Common Lane. If TfL get their way it'll look like this. I went down at the weekend, and can confirm that currently it looks nothing like. 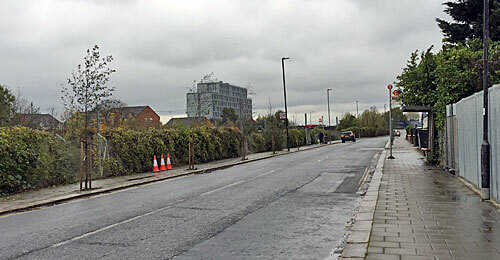 Old Oak Common Lane is drab road raised higher than its surroundings, with the Overground on one side and an utter sprawl of railway sidings on the other. If you like railways, there are places round here you can look out and believe London is covered by nothing else. Part of what's down below is GWR's Old Oak Common Depot, another part is where the Heathrow Express marshals its stock, and a significant proportion is going to be home to one of Crossrail's largest train depots. The first batch of new housing will be going in alongside, but oh how much more they could have built if only storing trains wasn't such an uneconomic waste of space. A couple of car maintenance sheds survive on Old Oak Common Lane, plus some vacant warehouse units, but the adjacent prefab-style greasy spoon has closed. A little up the road is London's first collective block for millennial "co-living", where your room may be tiny but there's a gym, spa and cinema downstairs for an all-inclusive rent. Across the tracks is a small enclave of private housing, somewhat adrift at present, but which may gain an overpass into the new station if built. And further down the road an Edwardian housing estate begins, at the tip of Acton, with posters in windows protesting against the havoc ten years of HS2 construction will bring. These homes will be the 'lucky' recipients of a brand new Overground station on their doorstep, but it isn't for them, it's for the newcomers who will pack out the matchboxes nearby. If you'd been here yesterday afternoon, or on Saturday, you could have spoken with the Overground project team as part of the official consultation process. Or perhaps you could. The location was The Nadi Park Royal, a Muslim community centre in a former office unit, immediately opposite where the new station's due to go. But there was nothing outside to say a consultation was happening within, and nothing obviously welcoming beyond a closed door, just perhaps some relieved staff sitting beside a plate of uneaten biscuits. I could have tried a little harder to check, but the lack of any signs deterred me, as perhaps was this box-ticking exercise's intention. The second new station would be on the line south from Willesden Junction towards Clapham Junction, about quarter of a mile from the former, indeed barely any distance at all. It's two miles down to Shepherd's Bush where trains next stop, but none of the existing residents along this hiatus will ever get a new station because they're poor, and the Evening Standard Homes & Property section is not for them. It's not often I visit a new location and go "Wow, I never knew this was here!" but Hythe Road was one of these. 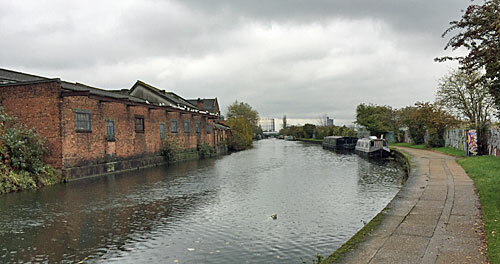 I'd seen the site from the Grand Union Canal towpath, seemingly yet another run of rundown warehouses, but never crossed the footbridge, or thought to follow the uninviting subway from Scrubs Lane under the railway. What greeted me here was a huge trading estate given over mostly to just one commodity - used cars. Cavernous sheds to left and right contain thousands of ready-to-buy vehicles, divided into separate buildings by make, with further cars out front for your perusal. All the poshest cars are indoors, whereas most of the hatchbacks get wet. And it goes on, and on, and on. 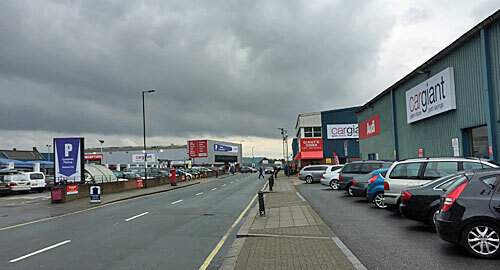 This is the Car Giant site, a company who've realised they're sitting on an expanse of land with 'goldmine' potential, and have been hoping to do a deal with housing developers and/or a local football club for years. They'll succeed, but in the meantime London's would-be car owners, and those from the Home Counties, turn up in droves in search of an elusive four-wheeled bargain. They walk round endless windscreens, they peer through an eternity of side windows, they drag their unwilling children along for the ride, and they might even stop off at the Giants Diner for a meal afterwards. I have no idea where 10000+ cars will go once the business closes, but it seems lowbrow commercial activity no longer has any place in Inner London. 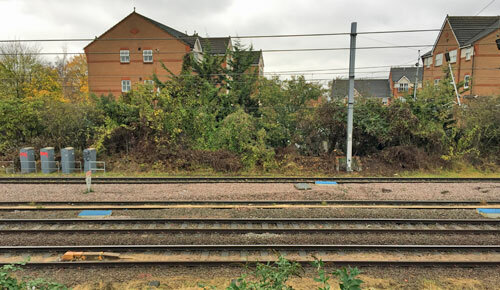 The actual site of the proposed station is on the other side of the railway embankment, on what's now Salter Street. The units here once housed Mallandian Corrugated Containers Ltd and the High Frequency Heat Treatment Co, amongst others, but are now fenced off and watched over by guard dogs and a security bloke in a lonely cabin. Across the road is the Triangle Trading Estate, still up and running, but a million miles away from the swish towers and boulevards that'll one day wipe the lot away. The whole area reminded me very much of the Lower Lea Valley before the Olympics came, and in the same way I'm pleased I've seen the place before the whirlwind descends. A hemmed-in alleyway follows the railway embankment north around the back of a metal recyclers and various other future undesirables. 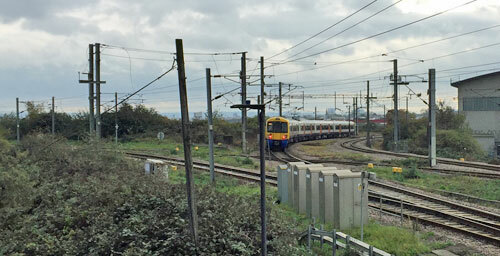 Steps then lead up to a precipitous footbridge which crosses seven railway tracks, including the West Coast mainline, and emerges via an almost-hidden entrance near the back of Willesden Junction station. It's not a pleasant walk, but short enough that the idea of building a new station at Hythe Road looks ludicrous, except to boost house prices. 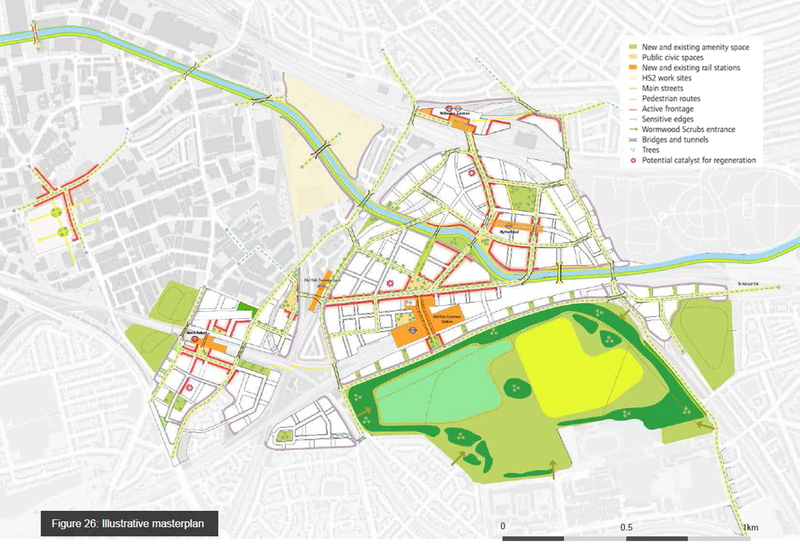 But factor in a five minute walk from Hythe Road to one end of the HS2 station, and ten minutes to the proposed Crossrail platforms, and you can start to see the point. Neither of these two proposed Overground stations are going to be particularly convenient for future interchange, alas, but they'll be a lot better than building nothing at all.